This quiet little town in the heart of the Owens Valley has been the County seat of sprawling Inyo County since 1866. Known as the Little Town with the Big History. The spirit of Paiute Indians, the town's first gold miners, cattle ranchers, railroad builders and movie pioneers still lives on in the shadow of the great Sierra Nevada. 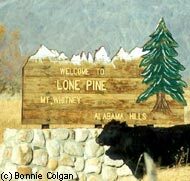 The town of Lone Pine is named after the lonely pine tree that was found at the mouth of Lone Pine Canyon. The town was founded during the 1860's to provide supplies to the local gold and silver mining communities of Kearsarge, Cerro Gordo and Darwin, and later to farmers and ranchers. The pine tree has long since vanished, destroyed in flood. Independence and Lone Pine are 1½ hours south of Mammoth. Both towns have plenty lot of things to see down, have trailheads for hiking, have their own special events, but also a few very notable sites to see, besides the great antique stores with authentic old west collectibles along the 395 Highway. Located one block north of the Courthouse on Highway 395, this residence was used by the Fort Independence commander. It was built in 1872 to replace quake damaged adobe buildings. This house was moved in pieces to it's present location where it was rebuilt in 1877 after the closure of Fort Independence. The Commanders House is open Saturday and Sunday, noon till 4 throughout the summer months. Open Daily 8am to 4:50 pm. This is a cooperative effort of many agencies and institutions ranging from the Forest Service to the University of California. The center includes a bookstore operated by the Eastern Sierra Interpretive Association and they sell books, maps, and other interesting items. You will also find numerous exhibits and a wealth of travel information for the entire region. The Interagency Visitors Center is located 1 mile south of Lone Pine at the Junction of RT. 136 and US 395. The Inyo Forest is host to several old mining towns. When you're planning your road trips up Highway 395 you might want to check out a few of these. You can give yourself a whole day just finding the old Mammoth Consolidated Gold Mine, the Lake Mining District and even go all the way up to the mining town of Bodie. Mt. 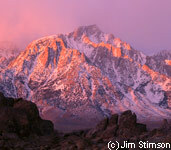 Whitney is likely the most famous landmark in Lone Pine. The trailhead is easily accessible by car, and you can drive up, have lunch in the portal store and take lots of gorgeous scenic pictures. The hike of Mt. Whitney starts here but that must be a well planned out adventure. Even so, it is fun for the family to drive up to the portal store, grab a Mt. Whitney souvenir and take those photos. These are the oldest known trees and have been around since the Egyptians built the pyramids. It is a site to behold, but please prepare as you should bring food and water as this is a very remote locale. Access is via state route 168 east from Big Pine up to White Mountain Road which is paved to the visitor center at the Schulman Grove but the road changes to dirt beyond here for the 11 mile trip to the Patriarch Grove which contains the largest of the Bristlecone trees here in the White Mountains. Open June through October with a visitor center that has a small fee. The Manzanar Relocation Camp museum tells the tale of the old Japanese internment camps and is an amazing museum. They have interactive shows, collectibles and movies about what happened during this time period. As children often read about Manzanar in elementary school, this is a must stop on your adventures through Inyo County and Lone Pine. There are several museums worth stopping if you're going to learn about the history of the area. As the area is rich in Indian culture, you'll learn all about native history as the Eastern Sierra Museums have one of the finest collections of Paiute and Shoshone Indian artifacts. Also, that includes rare photographs, diagrams, and mementos. Additional exhibits include antique wagons, tractors, mining implements, a Paiute Indian dwelling, and a reconstructed pioneer town. The museum operates 10am to 4pm daily (closed Tuesdays and major holidays). Here you will find the most extensive collection of Artifacts in the area. Displays include an exhibit about the nearby Manzanar Japanese Relocation Camp, Native Paiute and Shoshone basketry and other Native American crafts, Early farm and mining equipment, an extensive photo collection, a library of local history and a reconstructed pioneer village. Books of local interest are also for sale. Museum is open every day except Tuesdays and Major Holidays from 10am till 4pm. Donations are accepted. Located three blocks west of Highway 395 via Market Street to Grant Street.